We all hang on to mementos and items that have special meaning to us. Parents hang on to their child’s first drawing, report cards, a lock of hair from their first haircut and even the first tooth they lose. You might have an item from your childhood you just can’t throw away. Whatever it is, we keep these sentimental trinkets years past their prime. Something you might not think about holding on to—but definitely should—are your car’s service records. Your car’s service records are proof you have kept up with your vehicle’s maintenance and can help increase its trade-in or resale value. They also help keep your car’s warranty in tact. When you have a detailed history of when and where your car’s been serviced, it puts potential buyers at ease and proves you’ve been a responsible car owner. Proper vehicle maintenance requires more than an oil change every 3,000 miles. You need to check the air pressure in your tires at least once a month, as well as inspect the tread. Changing your cabin and engine air filter regularly is another must. For a complete list of what all needs to be checked and/or changed in your vehicle, follow the suggested maintenance intervals in your owners manual. Certain things need to be changed as soon as every 3,000 miles (i.e. engine oil), while others only need to be checked to make sure they’re still in proper working condition (i.e. wiper blades, belts, etc.). If you’re like me, you take the receipt from the work you just had done and shove it into your glove compartment. Though convenient, it’s not the smartest move, since they could easily become lost or damaged in there. Make sure you always have proof of all the maintenance and upgrades you do to your car, make copies of your service tickets and stash them in a safe place. 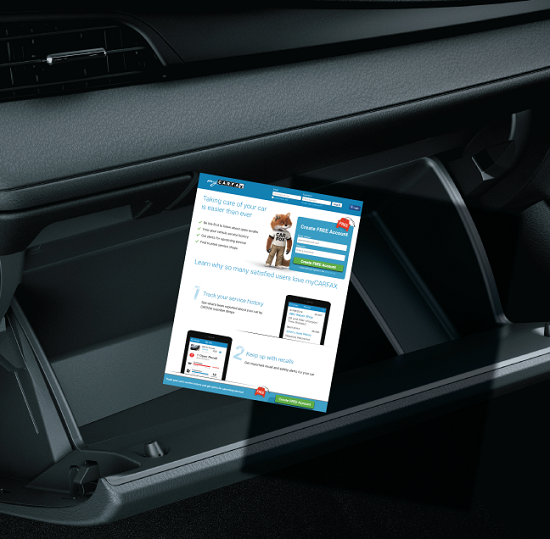 Better yet, download an app to help you de-clutter your glove box. The MyCarfax app keeps track of all your service records, past and present, and even reminds you of upcoming maintenance you should perform based on your car’s make and model. The app also alerts you to any open recalls on your car, allows you to look for repair shops in the Carfax service network and helps you find out how much service and repairs cost. Even if you own more than one car, that’s OK. The app lets you manage service history for up to five cars. All you have to do is enter the license plate number, and Carfax does the rest. Now, I mentioned keeping up with your service records could help increase your vehicle’s trade-in or resale value. Here’s how: the potential buyer can see and track when and where you’ve had maintenance performed, that you’re the legitimate owner of the vehicle and your car really does have just 20,000 miles on it. All of these things are your proof and will allow you to justify the selling price of your car. Your service records can also be your saving grace if a warranty-related issue arises. Most manufacturer warranties require proof that you haven’t been negligent with your vehicle. If you can’t show you’ve been taking care of your car and a vital component breaks, your warranty may be voided and you could be liable for the cost to fix and/or repair the part. Though not as cuddly as your childhood teddy bear, your car’s service records should be just as cherished. Keep them safe, whether with hard copies stored in a folder at home, via an app on your smartphone or online through a website. They may help you in the future.